For hard good promotional products. Minimum order quantity is listed on the product page. Less than minimum ordering is generally available however a less than minimum cost is generally associated with this request. If you have a smaller quantity order please contact us for an accurate price. What is pricing based on? Pricing is based on the style of the garment or product you are looking to order, the quantity (amount) you will be ordering and the type of decoration that will be placed on the garment. With screen printing pricing is based on the number of locations (chest, shoulders, sleeves) and the number of colours you want per location (2 colour chest + 1 colour back + customized sleeve). 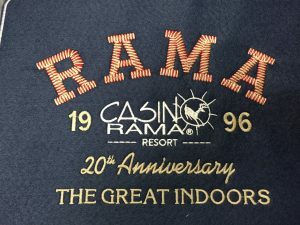 Embroidery pricing is based on the number of stitches in a logo and the size of the logo (the colour aspect of the screen printing pricing does not affect embroidery pricing). The pricing for digital print and direct to garment print is based on the size of the logo (the larger the logo the more ink is used and therefore increasing the cost). What file formats do you accept for artwork? In our industry the preferred file format for artwork is to be in “Vector” format. Vector is a fancy way of saying Original artwork. Any of the following file extensions can be submitted: .pdf, .ai , .cdr, .epd. Don’t have access to these file formats? We can help re-create your artwork as well from a JPG, TIFF & BMP for as little as $15. I want my garments personalized. What is my cost? I am not sure of my sizing. How do I know what size shirt I will need? 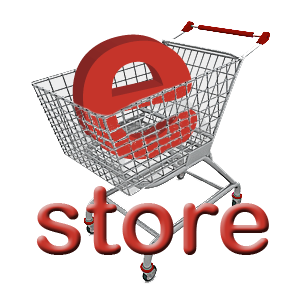 For most of our products we have size charts available. If you require a size chart please contact your sales rep in order to accurately place your appropriately sized order. 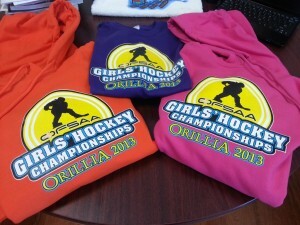 We also have a variety of sizing samples available as per request. Contact your sales rep to see if the style you wish to order is stocked in our show room for you to check out. What are the differences in printing processes and what is best for my order? Printing processes are constantly changing within our industry. Many of our suppliers offer different printing processes that can be unique to their business and can be explored more on their websites. For our personal printing processes we offer Screen Printing, Direct to Garment Printing, Traditional Embroidery, Thick Yarn Embroidery, Tackle Twill & Digital Heat Transfer. 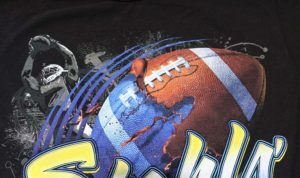 What is Screen Printing: Screen Printing is a traditional imprint method that has been around for decade and is the most common decoration method for t-shirts, sweatshirts and custom team jerseys. When you screen print your logo onto a garment it is through a mesh “screen” that is placed on top of your garment with ink being “squeegeed” over the screen and then onto your garment. The ink is then dried through a conveyor dryer to set the design in place. Screen Printing is a proven quality imprint service that if washed properly will not crack chip or fade and can last through hundreds of washes. What is Direct to Garment Printing: KE now offers in house DTG printing that can be used to decorate not only garments but a variety of traditional hard good items such as magnets, lighters, buttons, bottles, hockey pucks, picture frames, cell phone cases & much more. DTG printing is basically done with the same principals as your basic desktop paper printer. Ink is directly printed and cured through UV light to obtain optimal designs. DTG printing is great for lower quantity orders that require a great attention to detail that can not be obtained by screen printing. Embroidery: Is a fully automated process that sews a design onto garments using a needle and thread. At KE we use a combination of Isocord threads (for traditional embroidery) and Medera threads (for thick yarn embroidery).Embroidery is great for jackets, hoodies and headwear. We do not suggest that you embroider on lighter garments such as t-shirts & tank tops as the weight of the thread will bunch the light fabric and will not lie flat. 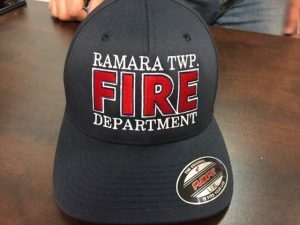 Some custom logos will have to be simplified to achieve the best embroidery results. The cost of embroidery varies based on the number of stitches in a logo (which translates to the time the garment spends on the machine). Thick Yarn Embroidery: TYE goes through the same process as traditional embroidery however it is done using Medera thick yarn thread. 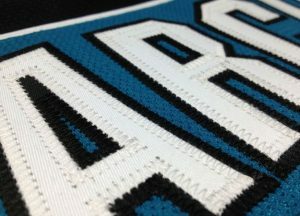 We use this process to cut down on the number of stitches needed in a logo (reducing your cost) and to give the embroidery a softer more retail appearance (think Campus Crew or NFL.com). TYE is typically used most often with large front or back logo’s. Check out our TYE page for examples of this process. 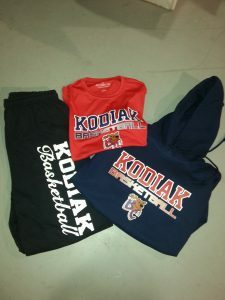 Digital Heat Transfer: This is a great process for smaller custom orders and is typically used for school spiritwear orders that may require add on’s. It is also a great process for extremely detailed and colourful artwork (similiar to DTG printing). With this method your logo/design is printed onto a special media which is then heat pressed onto your garment. This process has a different feel and weight when compared to a screen print (it is typically heavier with a more paper feel). Tackle Twill Emboidery: Twill decoration is traditionally seen by many high schools, colllege’s, university and team organizations. It is typically the most expensive way to decorate your apparel. The twill material (generally lettering) is cut with our laser machine then sewn onto the garment using a “walking stitch”. If you are looking for product ideas or pricing details we are glad to help!